Would you like to learn more about the different types of flowers, about flower identification and what is growing in the wild and in the gardens? Please scroll down for a list of different kinds of flowers! Would you also like to enjoy beautiful flower pictures and information on how to grow and how to care for flowers? I am very happy to share my expertise on flowers combined with my passion for photography! 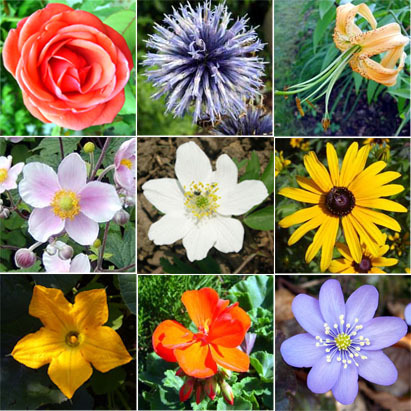 I aim to put together a flower identification guide, to build an extensive flowers encyclopedia and to compile a list of flower names over time. It takes time to build a website. This website will steadily grow over time and I would be thrilled if you would frequently come back to check on the growing content and valuable information. We have the year 2010 and this is the International Year for Biodiversity. Let us discover and share the values and beauties of our nature. Keep in mind: without flowers we would not exist. No flowers - no plant reproduction - no food base.